It’s a curious thing that the two classes of matter that make up our universe behave so differently. Baryonic matter, the matter out of which we and most things we interact with on a daily basis are made of, obey four fundamental forces. In comparison, dark matter seems to obey only one: gravity. The appearance of a single dark force may only be a guise—it’s possible that other forces are at work but, because of our inability to see dark matter, we are blind to them. Undeterred, physicists have dreamed up a multitude of possible new interactions between dark matter particles. Some of these models were put forward to explain observations that gravity-only dark matter (called cold dark matter, or CDM, for short) could not explain. These problems included the existence of galaxies with lower densities than expected at their centers (the core-cusp problem) and the dearth of small galaxies orbiting the Milky Way. One particularly promising model envisions that dark matter particles interact in such a way that causes them to scatter like billiard balls off of each other—this is known as self-interacting dark matter, or SIDM for short. The authors of today’s paper show that there’s newfound hope for detecting such interactions. When dark matter particles scatter off of each other, they exchange momentum, which on a grander scale causes the dark matter densities at the centers of galaxies to be lower than with CDM. 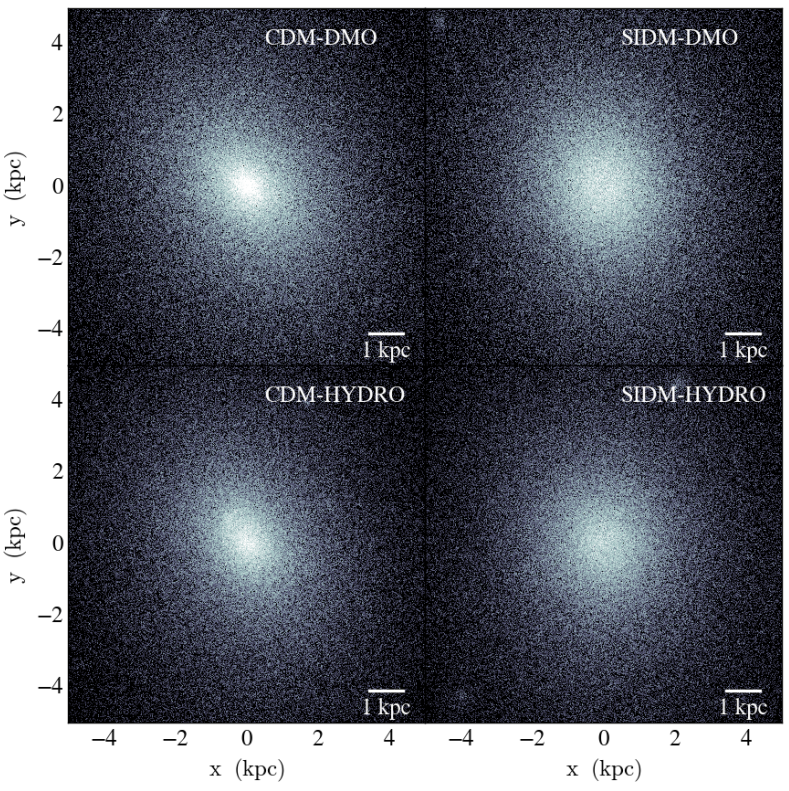 In fact, while CDM galaxies tend to have densities that continue to increase towards their centers, the density at the centers of SIDM galaxies rise far less and possess a nearly uniform density “core”. Thus measuring low central densities in galaxies is a dead ringer for SIDM—except for the fact that plain old baryonic matter can also produce similarly depressed densities. Baryonic processes such as stars going supernovae can blast matter out of the centers of galaxies and generate cores. We thus had a tricky problem on our hands—were the cores we observed due to baryons, or dark matter self-interactions? To see how important the competing influences of SIDM and baryons are, the authors simulated four low mass galaxies with stellar masses ranging from about half a million to ten million solar masses. Each of these galaxies were modeled with and without dark matter self-interactions (with a self-interaction cross section of 1 cm^2/g, or about a thousandth the probability that two billiard balls the size of atomic nuclei would hit each other). Each of the four SIDM and CDM galaxies were run in turn with and without baryons. They found that with CDM, galaxies with increasingly fewer stars had denser centers and more sharply rising density profiles. With SIDM, however, the densities remained cored no matter the number of stars. Thus galaxies with few stars—those with less than a few million solar masses in stars—cannot form cores with baryons alone. Self-interactions, however, can—thus by observing the least massive galaxies and determining whether or not they have low central densities, one could potentially determine whether or not dark matter does indeed obey a new force. Figure 1. The densities of dwarf galaxies with and without dark matter self interactions. On the left are the density profiles of dwarfs with low stellar masses, ranging from half a million to 5 million times the mass of the Sun. The simulation in which the dark matter particles do not interact (CDM) are shown with the solid lines, while those that simulated self-interactions are shown with a dashed line. At the centers of the CDM galaxies, the densities continue to rise steeply, whereas in SIDM galaxies, the density profiles “turn over” and flatten to lower densities. In comparison, a dwarf with lots of stars—about ten million solar masses—is shown on the right. In both the CDM and SIDM simulations of this galaxy, the density profiles turn over and flatten towards the center due to the supernovae and other baryonic effects (although the SIDM galaxy still has a lower density core). Figure taken from today’s paper. There are other fingerprints that self-interactions leave behind on the smallest galaxies. The redistribution of momentum caused by dark matter interactions cause SIDM halos to be rounder than those in CDM (see Fig. 2). However, this isn’t necessarily true for the galaxies that live within them—in an SIDM universe, the galaxies aren’t very round, like those in CDM. It appears that baryonic—not dark matter—physics determines the shape of the galaxies, and thus galaxy shapes aren’t so promising an avenue for constraining SIDM. Figure 2. Changes in the shape of a dark matter halo, assuming different dark matter and baryonic physics. The halo shown is that in which a galaxy with about five million solar masses in stars formed. On the left is shown the halo when simulated with CDM, SIDM is on the right. The SIDM halos are clearly rounder and less dense in their centers. For both CDM and SIDM simulations, the halo was simulated without baryons (e.g. no formation of stars, nor any associated baryonic physics like supernovae explosions), shown on top, and with baryons, shown on bottom. The presence of baryons does not strongly affect the shape of the dark matter halo in which they form. Figure taken from today’s paper. These results promising a tantalizing peek at the dark forces at work among dark matter particles. However, it may be difficult to measure the central densities in dwarf galaxies that are isolated like the ones in today’s paper (e.g. a field dwarf, which isn’t close to and thus unperturbed or disrupted by a larger galaxy like the Milky Way) which are notoriously dim and difficult to observe. However, with upcoming missions such as WFIRST that may be able to help us measure the central densities in faraway field dwarfs, such results may be at our fingertips in the near future.